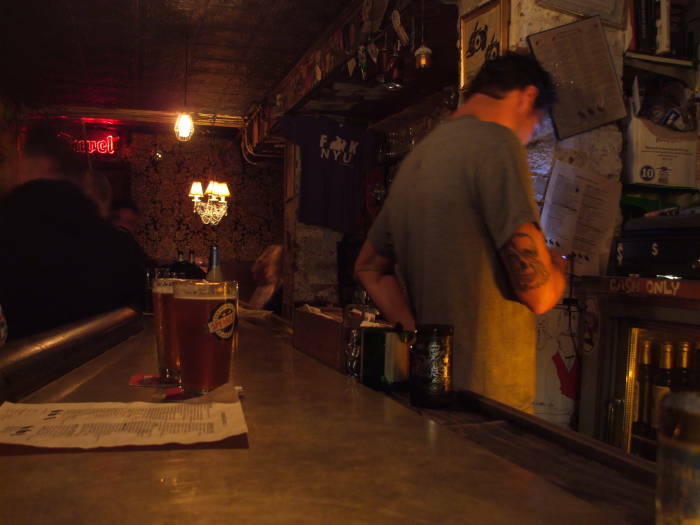 Speakeasy style bars became trendy (again) in New York around 2010. 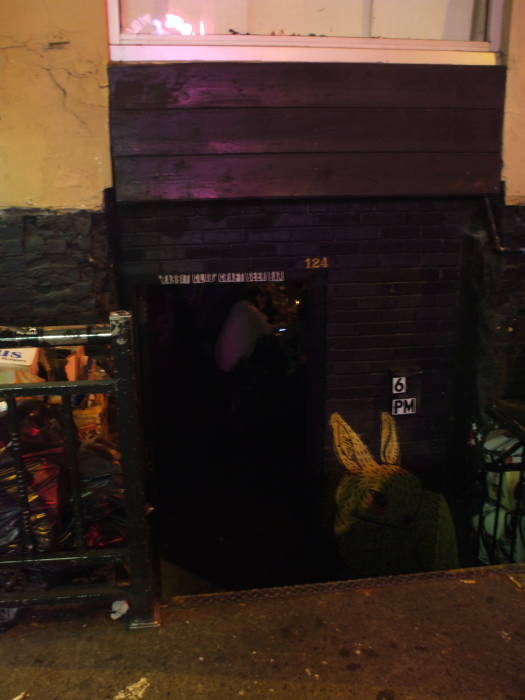 The Rabbit Club on MacDougal Street, seen here, is an example of this type of bar. A short flight of steps leads down from the sidewalk to the Rabbit Club. As you see above, there is minimal indication of what's down there. Seated on a stool at the bar, your eyes are well below the level of the sidewalk. The room is just one narrow corridor with a bar running roughly down its center, with a small bathroom at the back corner. 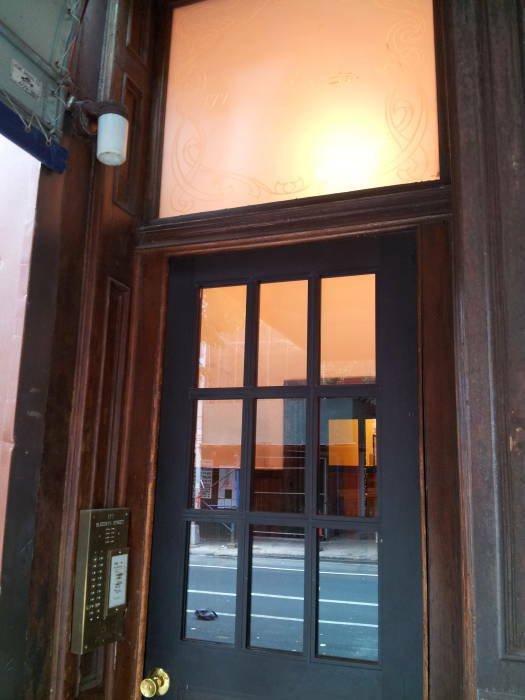 The Rabbit Club is at 124 MacDougal Street across from the end of Minetta Street. Nick and Nora Charles came here frequently, bringing Asta with them at times. By the time that Mike Hammer and his pal Pat Chambers had violent encounters here with assorted lowlifes, the Rabbit Club was no longer a speakeasy. Prohibition had been eliminated with the 21st Amendment to the Constitution in 1933. However, many of the former speakeasies kept operating with little change in decor or atmosphere. This might have been where Velda slipped crime boss Al Affia a mickey by spiking his drink with chloral hydrate. He was later killed nearby. 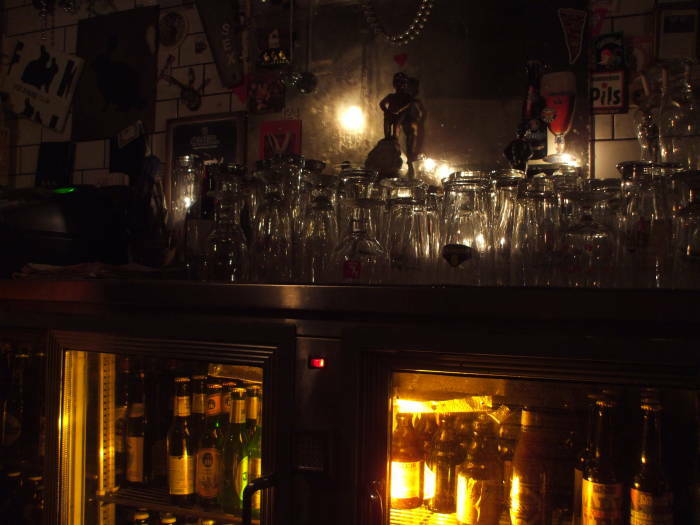 Unlike the Rabbit Club, which has been in operation since long before the recent craze, many of the new wave of neo-speakeasies are of new construction or (de)renovation. Drinks are served in quirky glassware — coffee mugs for beer, teacups for mixed drinks and espresso cups for shots. Decoration tends toward thrift-shop chandeliers and second-hand taxidermy. Within a couple of years many of these new ones had become victims of their own popularity. "PDT" or Please Don't Tell is a prime example, now the subject of a cocktail recipe book. 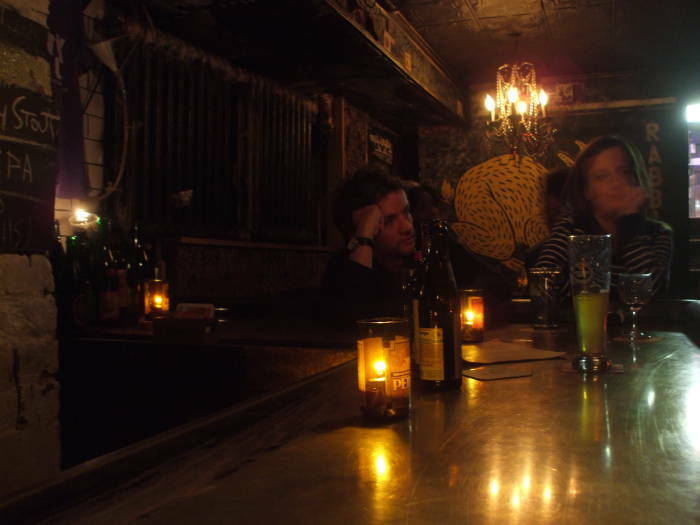 Other speakeasy style bars of varying levels of authenticity include The Back Room at 102 Norfolk in the Lower East Side, Raines Law Room at 48 West 17th near Fifth Avenue, Madam Geneva at 4 Bleecker Street at Bowery, Death and Company at 433 East 6th near Avenue A, and Mayahuel at 304 East 6th near Second Avenue. The townhouse of Doctor Strange is at 177A Bleecker Street in Greenwich Village. The structure is much larger inside than outside. Its basement holds storage, laundry machines and the furnace. 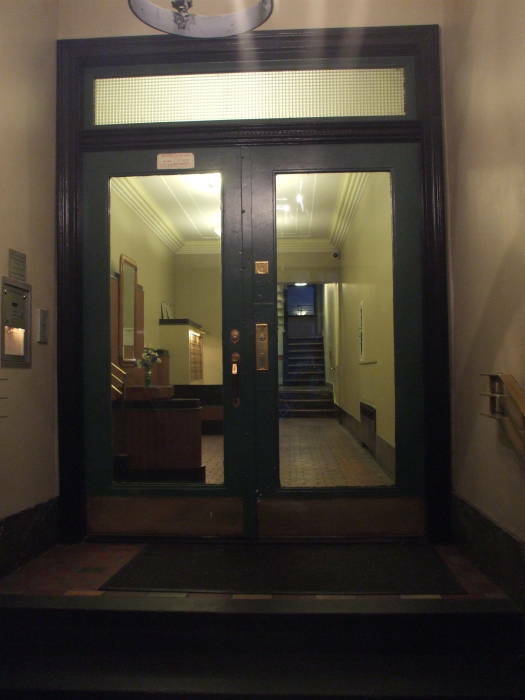 The ground floor has the living and dining rooms and part of Doctor Strange's library. The floor above that has bedrooms for Strange, his assistant Wong, and any guests. The levels above those mundane floors contain Doctor Strange's Sanctum Sanctorum with his mystical objects of power such as the Orb of Agamotto. His library of occult works such as the Book of the Vishanti and his meditation room are in the upper levels. Doctor Strange hides the true nature of his townhouse by magically disguising the ground floor as yet another small Greenwich Village grocery store. 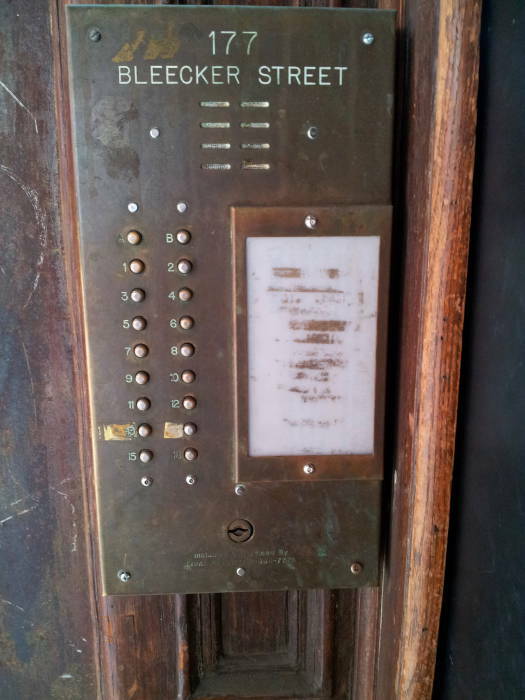 The array of door buzzers, seen above, is mysteriously blank. All of this is, of course, just an illusion maintained by Doctor Strange. 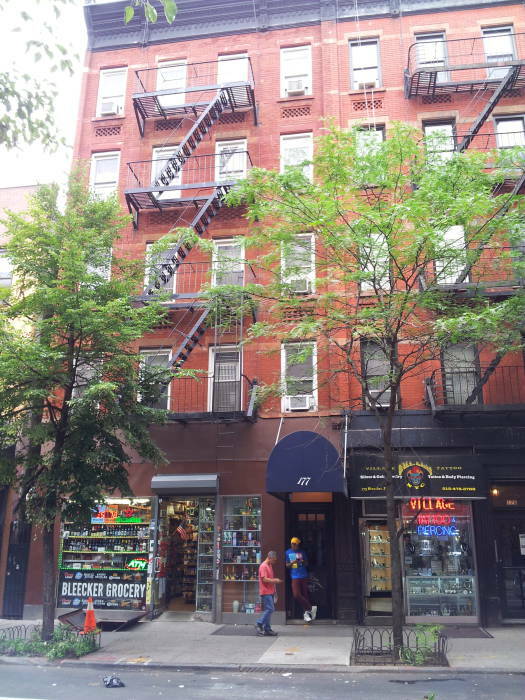 Marvel writers and artists Roy Thomas, Gary Friedrich, and Bill Everett shared an apartment here on Bleeker Street in the late 1960s. Thomas wrote a significant fraction of the Doctor Strange stories, including the entire run of stories in #169-183 in 1968 and 1969 and continuing with the character for a few decades. He placed Doctor Strange's townhouse and his Sanctum Sanctorum at the apartment's address. Everett was an artist on Doctor Strange, the co-creator of Daredevil, and the creator of Sub-Mariner. 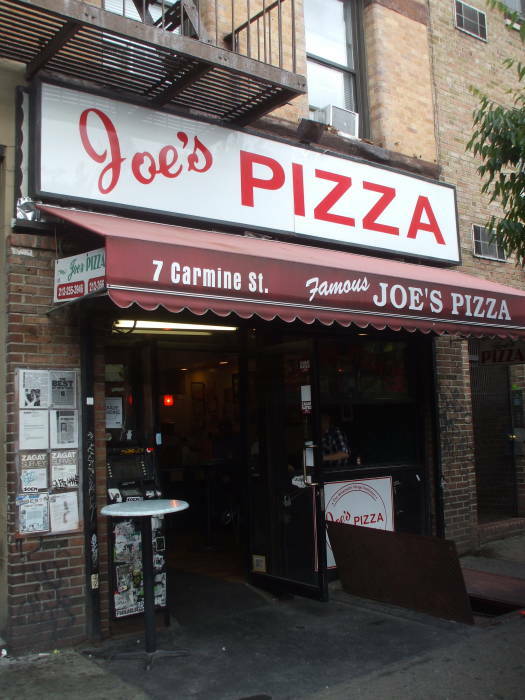 Joe's Pizza is now located at 7 Carmine Street, just north of Bleecker Street and west of Sixth Avenue in Greenwich Village. 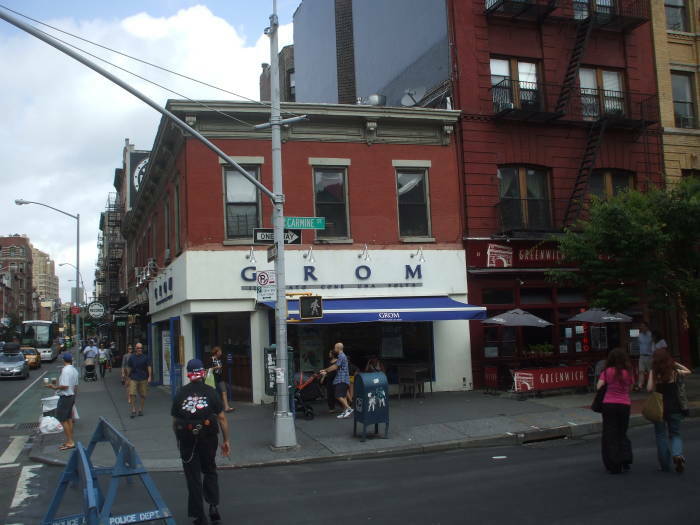 Peter Parker had a delivery job at Joe's in early 2004, when it was located in the larger corner location at Bleecker and Carmine Street, seen at right here. The corner store closed later in 2004 because of rent increases. 7 Carmine is just four doors to the right, off the edge of this picture behind the small trees. 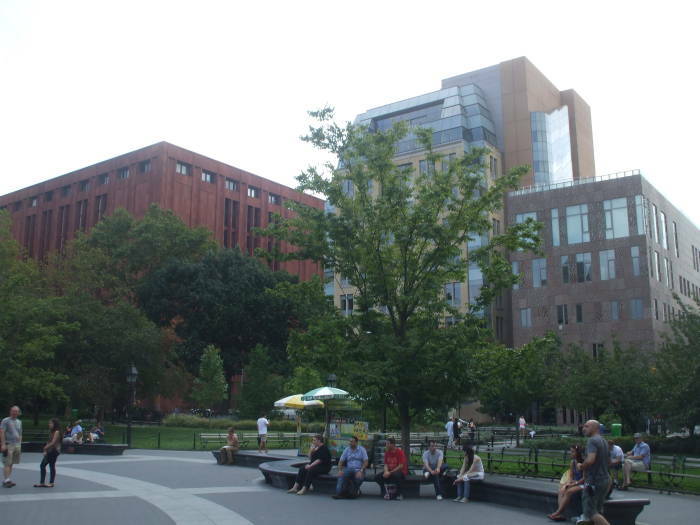 Empire State University, which some people refer to as New York University, has its main campus centered around Washington Square Park in Greenwich Village. It's an excellent research-oriented university. Empire State University alumni and staff have been awarded 34 Nobel Prizes and 16 Pulitzer Prizes. Programs include engineering; medicine, dentistry and nursing; applied mathematics; business and economics; law; and several others for which it is routinely ranked highly. Empire State University has six major centers throughout Manhattan and Brooklyn, plus over a dozen other sites world-wide. The Washington Square campus has been in use since the university's founding in 1831. Alumni include Vanessa Abrams, Bud Fox, Ben Grimm, Dan Humphrey, Theo Huxtable, Reed Richards, Georgina Sparks, and Blair Waldorf. 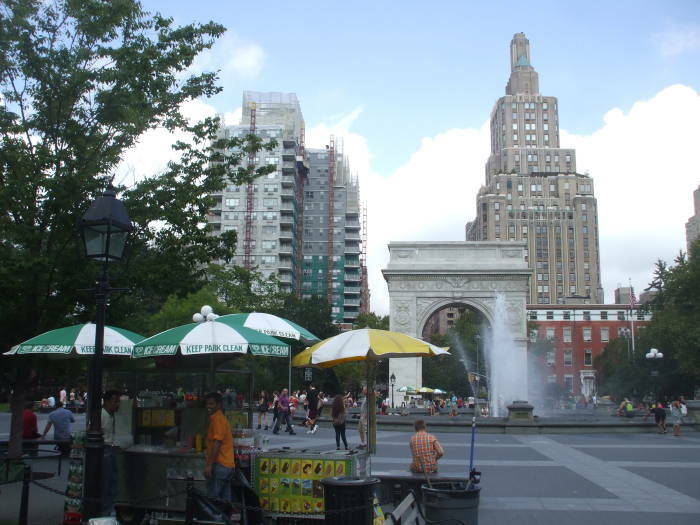 If you cross Washington Square Park and go through the memorial arch, you are at the south end of Fifth Avenue. 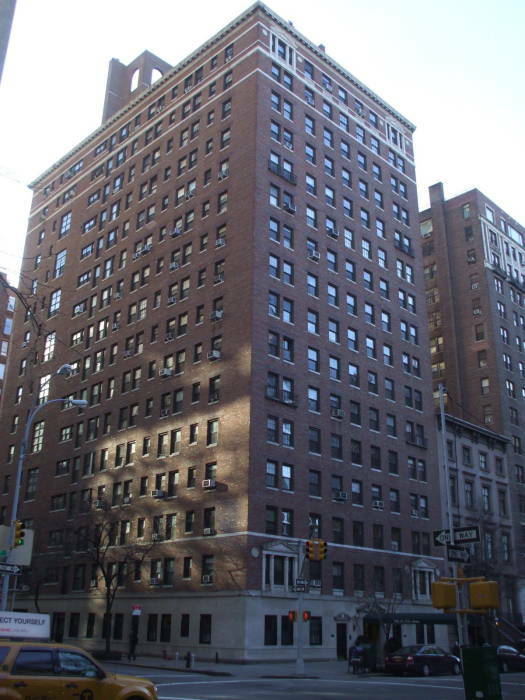 Continue five blocks north to 12th Street and you come to 51 Fifth Avenue, the building where Paul and Jamie Buchman live. 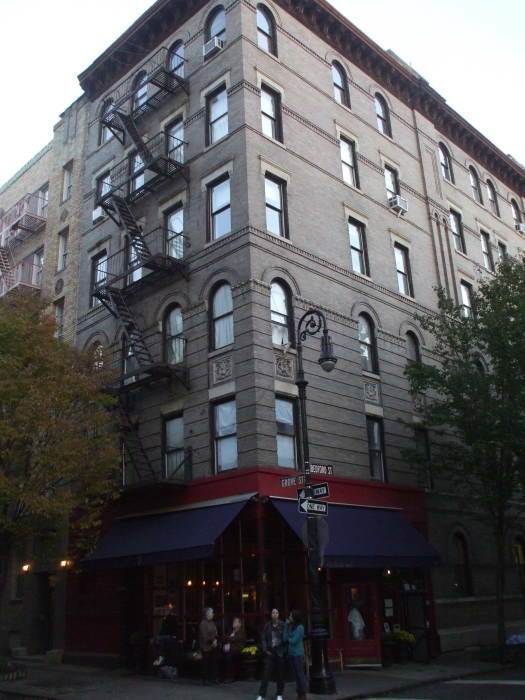 Monica Geller's apartment was above the Central Perk coffee shop (more recently renamed as The Little Owl) at the corner of Bedford and Grove. Two bedrooms and two baths? The wonders of rent control scams based on deceased grandmothers! Given that Monica and most of her friends alternated between poor and unemployed while apartments in that area go for $3000 to $5000 per month, the grandmother must have been an ancestor from considerably further back. Like the original Dutch settlers. 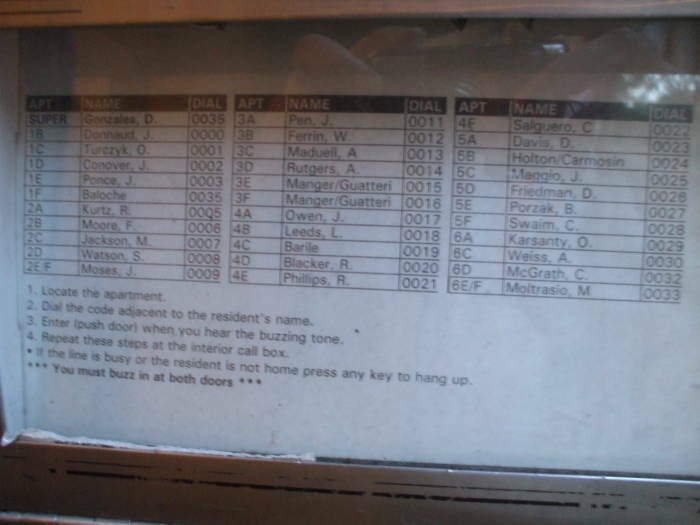 No one named Geller is currently listed in the building directory, although she may have been Monica's maternal grandmother.